My HUGE Skincare Routine - Cherry Colors - Cosmetics Heaven! My last update with my skincare routine was more than three years ago. Yes, that's right, THREE years ago. 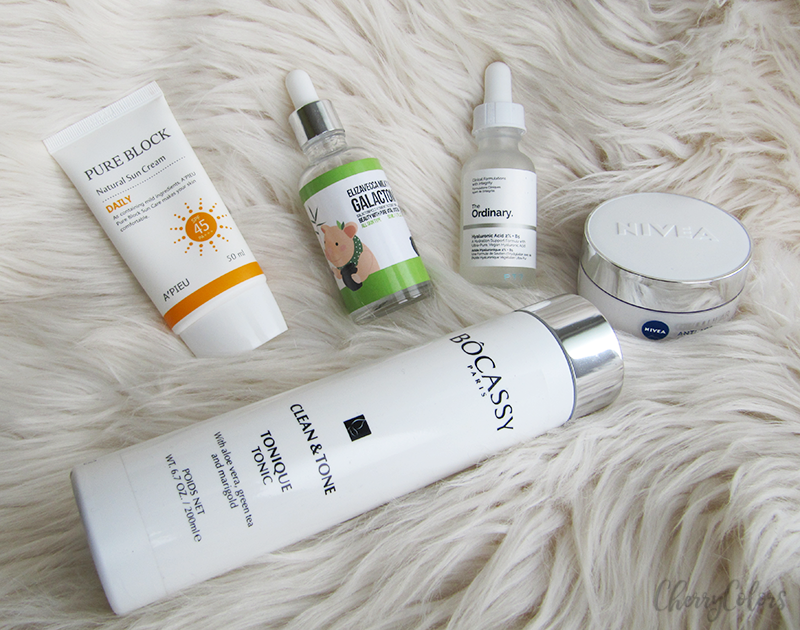 It's time to finally show you what I'm using now that I'm trying to avoid aging or at least postpone its effects on my skin. For more details on antiaging creams, read Anti Wrinkle Creams Reviews. My skin is combination meaning that during Winter my cheeks get dry and sometimes flaky and my forehead and nose become normal. During warmer months my cheeks become normal and T-zone becomes oily. I prefer oil cleansers that's why I'm using the Etude House Mild Cleansing Oil. I use it on dry skin and gently massage it in. After that, I wash it off with lukewarm water. I combine it with a very gentle gel cleansing by Balea - Ultra sensitive wash gel. 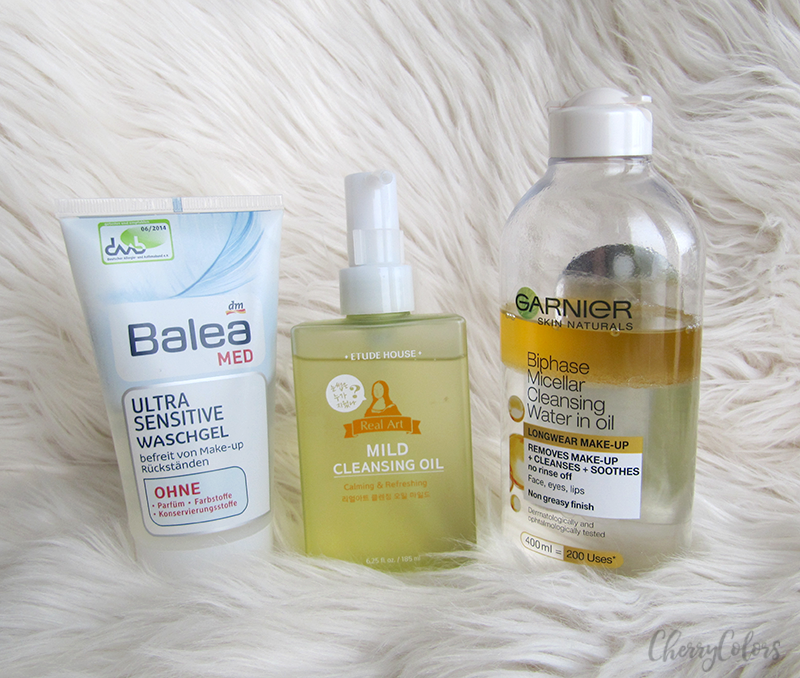 And if I have lots of heavy makeup on, I make sure to use a bit of the Garnier Biphase Micellar Cleansing Water in oil. It works miracles. Does it seem like a lot? I am not sure. I start with a clean face, usually, I just wash it with lukewarm water and proceed with a small amount of Bocassy Clean & Tone Tonic. I continue with The Ordinary Hyaluronic acid. Then I quickly add some Elizavecca Galactomyces drops and gently tap it into my skin. This product alone helped me with PIH and PIE. It's very lightweight and has almost no scent. It feels like water. Because I need to lock all this inside my skin to keep it nice and moisturized, I continue my routine with Nivea Cellular Anti-age day cream SPF 15. It's a lightweight cream that quickly sinks into my skin. But because SPF 15 is really too low for me, I use an additional sunscreen. 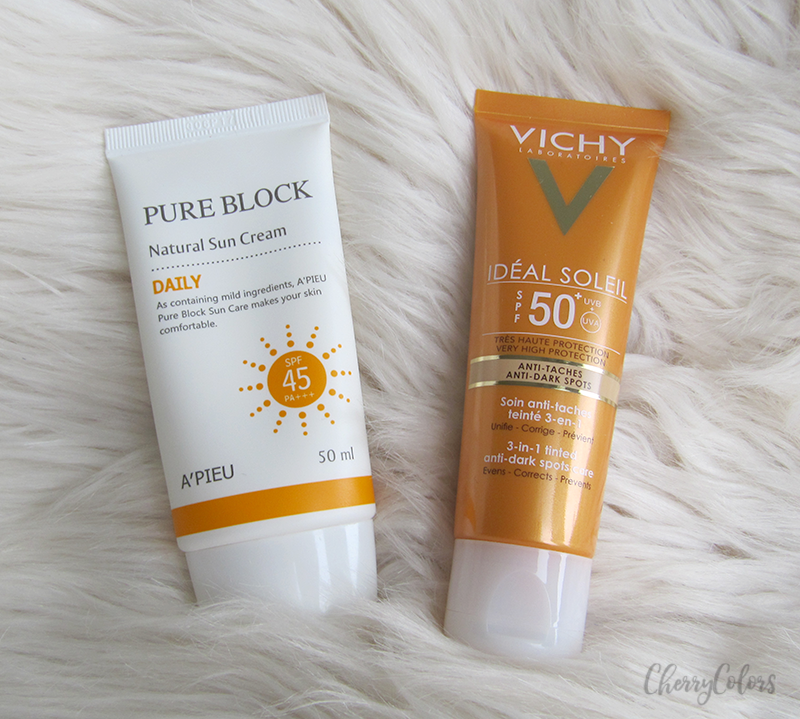 These are the two sunscreens I use. The A'Pieu Pure Block Daily SPF 45 PA+++ sinks in quickly, has a light citrus scent and doesn't leave any oily residue behind. The Vichy Ideal Soleil SPF 50 UV+UVB has a strong tint to it and the first 10 minutes I honestly look like an Oompa Loompa. After 10 minutes it somehow manages to sink into the skin and doesn't look half as bad as before. It is also very matte, so I make sure to moisturize prior using it. This looks like a lot, doesn't it? Well, yes it does. 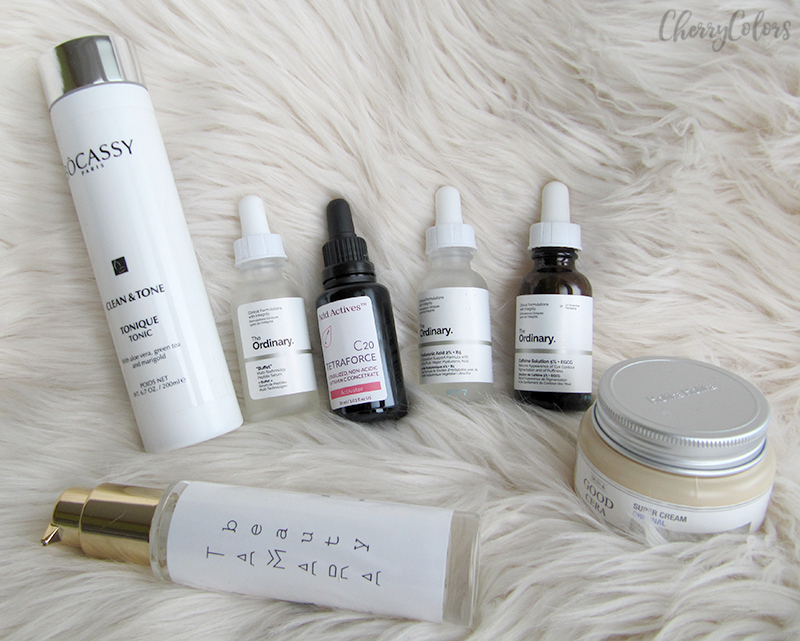 I start my routine by cleansing my face with apropriate products and then I jump right to the Bocassy Clean & Tone toner. I don't use a lot of it, so I'm sure this bottle will last me a very long time. The next step is The Ordinary Hyaluronic Acid that is followed right by The Ordinary Buffet. Both have a gel consistency and sink into my skin fairly quickly. I use The Ordinary Coffeine Solution on my undereye area to keep my undereyebags looking healthy and moisturized. The last step is adding a drop or two of C20 Tetraforce Vitamin C Concentrate to my night cream Holika Holika Good Cera. This cream is brilliant and I love it. I though I'd use it only every second day, but I realized that it does only good for my skin (helps to restore my skin barier) and isn't heavy at all. Sometimes I skip the Holika Holika Good Cera cream and instead use my custom blended cream by Alpstories. 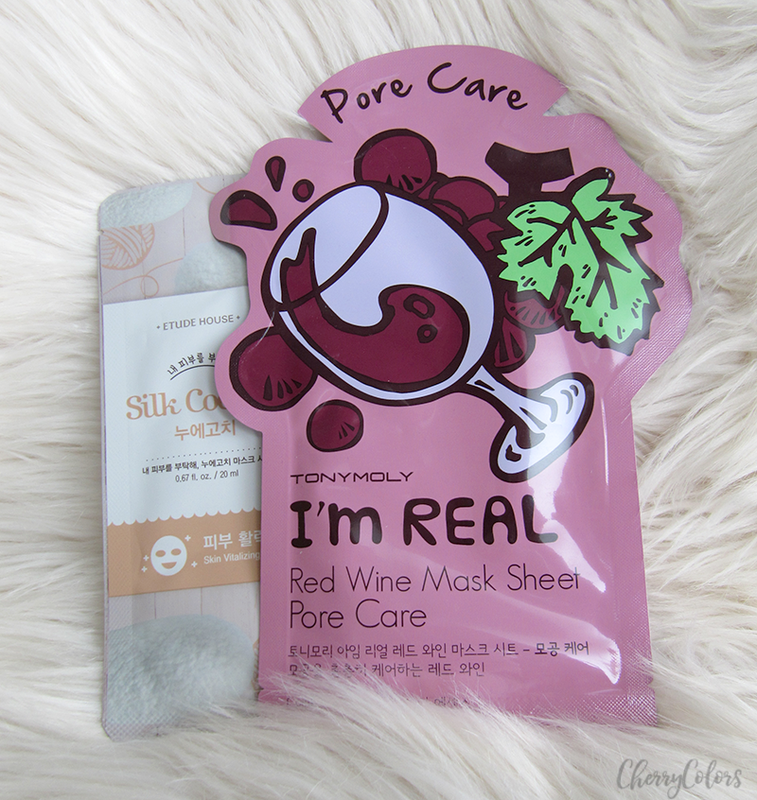 Whenever I feel like I need some pampering I will use a sheet mask. This is usually 1-2x per week, mostly during the weekends. I have many different brands of sheet masks and I make no differences between them, so I use them accordingly my current needs. If I feel that my skin is a bit on the dry side, I will finish my night routine with one of the two sleeping packs I own. 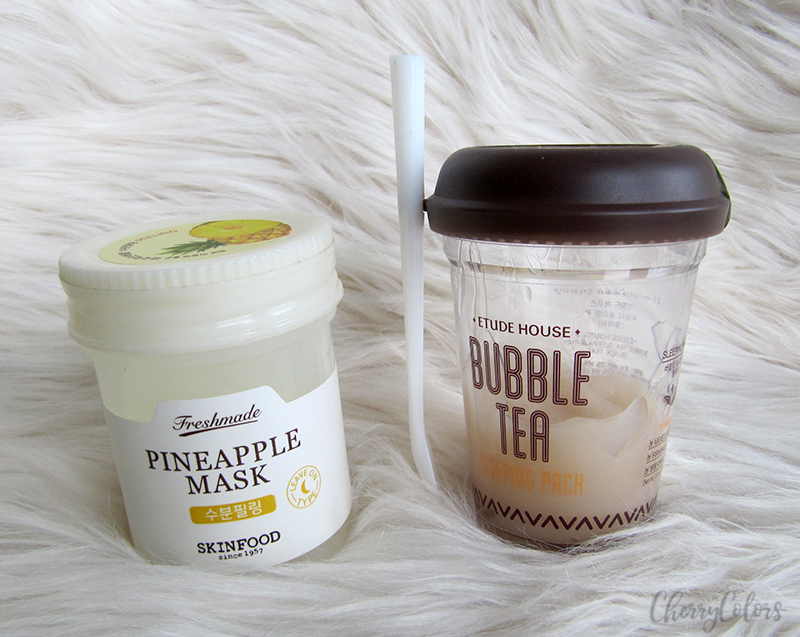 One is by Skinfood called Freshmade Pineapple Mask and the other is by Etude House Bubble Tea Black Tea sleeping pack. When I'm using a sleeping pack, I usually skip my night cream because I feel it is too heavy otherwise. 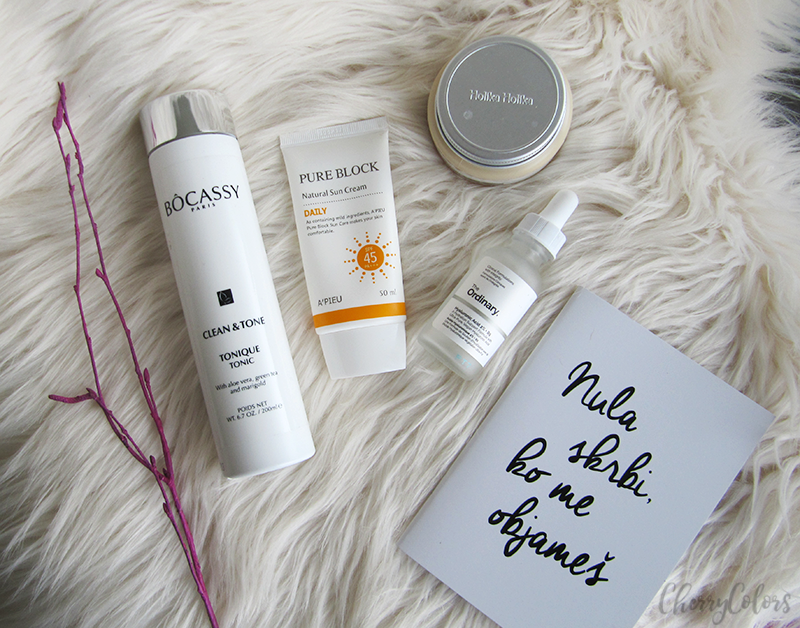 So far I'm very happy with my skincare routine - because my skin has never looked this good before! And at the same time, I am a bit concerned by the amount of items I have accumulated in my routine. I also reccomend eating well to get that lovely, glowy skin we are all searching for. A place to start is definitely the infographic on 10 vitamins for younger skin. Tell me, since I'm curious - what does your skincare routine look like?